Tentworld: What size Engel or Waeco do I get? So you've decided you would like an Engel or Waeco? Now, what size do you want? Do I want both fridge & freezer, or just fridge or freezer. 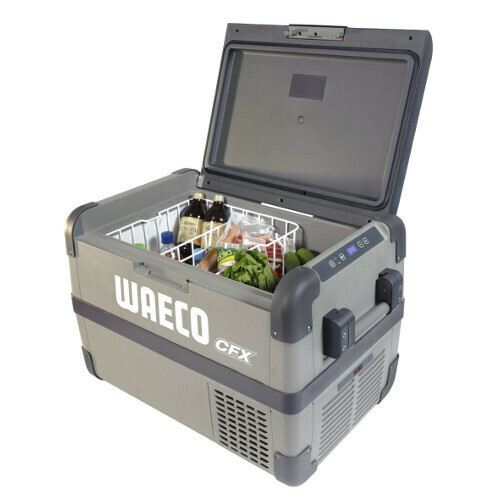 The Waeco CFX-50 is a good family fridge, or a travelling couple fridge. Do you need a freezer? In most cases, you do not need a freezer. If you want to keep meet for a long time, consider buying a vacuum sealer such as the Campfire Vacuum Sealer (Cryovac machine) your butcher might also own one. Some butchers will charge for you to use it, others will vacuum seal your meat for free. If you're vacuum sealing your beef and lamb, this can often keep for over a month under refridgeration alone - less than 4 degrees. Chicken and mince does not last quite as long. Having your meat vacuum sealed in most cases will eliminate the need to have a freezer when travelling. There is good reason to eliminate the freezer from your camping kit too, in most cases having a freezer nearly doubles your fridges energy consumption. For example the Waeco CFX-65 is sold in two different configurations - single zone CFX-65 or dual zone CFX-65DZ. The WAECO CFX-65 single zone will use on average 0.85 amps per hour. If you then take the WAECO CFX-65DZ your power consumption with the same fridge settings increases to 1.9 amps per hour! More than double! Who cares if my fridge uses more power!? I like having a freezer! I like my freezer too, but I also like to save money where I can. Without a freezer it means that I can have a smaller cheaper battery, smaller cheaper solar panel. Ontop of that, on weekenders you do not need a freezer at all so it means you can put in extra drinks! You can only put icecream in the freezer, and 19 litres of icecream is alot!! What size fridge do I need? Using your fridge on the road is much different to using your fridge at home. Especially when it comes to handling drinks. Generally most people when they buy a carton of softdrink or beer, will load it all into the fridge then and there. On the road, it's a good idea to load only what you'd drink in an hour. For instance, you might like to have two beers in the afternoon when you've set up camp. You generally have one beer in half an hour. Your Engel or Waeco is able to cool down a drink, when fully loaded in around an hour. So by the time you've finished your second beer, the first warm one you put in should be about right! Salads, and fruit. It's good to keep your salad & fruit in the fridge. However, for the most part this is totally unnecessary and only adds a small amount to the life of your salad. A good method for keeping your salad and fruit in the best condition, without refrigeration is to keep them in a cool dark place. For me, this is often an icebox or esky. I generally will not put any ice, or anything cold in the icebox but because of the insulation the temperature inside stays low and constant. You could occasionally move a bottle of water into there from inside your fridge too! This method has kept my fruit, salad and vegetables fresh for two weeks. HANDY TIP! When you've eaten food, replace that empty space in your fridge with drinks. Your fridge runs most efficiently when it's full of dense objects, water bottles, softdrink cans etc. So what size fridge do I need? Following everything that I mentioned above, I've found that if you work on having 10 litres per person per week then that will look after you nicely. You will have plenty of meat, always have a cold drink ready and will not go hungry! So if you're a family of four, and want to be able to go a week without resupply then a 40 litre fridge will look after you well! Similarly if you're a family of six, and want to last a week without resupply a 60 litre fridge would be most suitable for you. Need help deciding? Give us a call on 1300 836 896 and we'll help you choose a fridge that suits your requirements.